The clock has just ticked over from the 19th century to the 20th. It is right in the heartland of America: Jackson County, Missouri. And the year is 1904. So let’s say that’s what you’re researching. Say, for example, you descend from one Emma T. Adams. And you’re sure she lived right there in Jackson County, right at that time. Now generally you’d think this would be easy, wouldn’t you? After all, 1904 is right between the 1900 census and the 1910 census, and women began to be enumerated by name in 1850.1 Surely you can find Emma on one of those two censuses, no? So how do you prove Emma actually was there in 1904? That’s where yet another of those wonderful resources from the Midwest Genealogy Center will come into play. Yeah, that same Midwest Genealogy Center that’s taking The Legal Genealogist to Blue Springs, Missouri, today en route to the all-day Spring 2017 seminar tomorrow. So these are basically map books. Now that goes a long way towards making up for not being able to find her in the census, doesn’t it? Plat books. Digitized. For the lay of the land. Love maps! The Library of Congress has the Yazoo County, Mississippi land-ownership map by Mercer & Fontaine, 1874, online. This is my home county. Prior to finding the map online (in color) I used the B&W version on fiche at the local Family History center. I printed images from the map and pasted together to make a huge map of the county. Another comment: much can be learned about the family in deed records. Those are exactly the right questions to be asking… and the kinds of things every genealogist gets excited about! 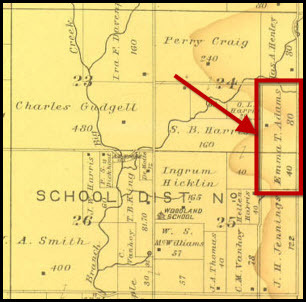 If you have ancestors that go back to 1840’s-1860s in Jackson County, are there plat maps for that too? Judy, I so enjoyed the seminar yesterday in Blue Springs, MO. Thanks for the great presentations. I was especially intrigued by the information you presented on the Baird family of Cherokee County, Alabama. My great-great-grandfather was James Jackson Norris who was living in the household of “Zebedee Baird” on the 1850 Cherokee County census. Although documentation is lacking, it is believed that 2 siblings of James J Norris married 2 of the children of Hiram & Mary Baird: Mary A Norris to Zebulon (or Zebedee) Baird and Nelson Norris to Harriet Baird. I really enjoyed seeing how you worked through some of challenges of research in that area. Amazing how our families backed into each other, Gary! I’m going to put my cousin Paula in touch with you — she’s researching the Bairds and you both may have tidbits to give the other!